A force is a push or pull acting upon an object as a result of its interaction with another object. There are a variety of types of forces. Previously in this lesson, a variety of force types were placed into two broad category headings on the basis of whether the force resulted from the contact or non-contact of the two interacting objects. These types of individual forces will now be discussed in more detail. To read about each force listed above, continue scrolling through this page. Or to read about an individual force, click on its name from the list below. An applied force is a force that is applied to an object by a person or another object. If a person is pushing a desk across the room, then there is an applied force acting upon the object. The applied force is the force exerted on the desk by the person. The normal force is the support force exerted upon an object that is in contact with another stable object. For example, if a book is resting upon a surface, then the surface is exerting an upward force upon the book in order to support the weight of the book. On occasions, a normal force is exerted horizontally between two objects that are in contact with each other. For instance, if a person leans against a wall, the wall pushes horizontally on the person. The friction force is discussed in more detail later on this page. The air resistance is a special type of frictional force that acts upon objects as they travel through the air. The force of air resistance is often observed to oppose the motion of an object. This force will frequently be neglected due to its negligible magnitude (and due to the fact that it is mathematically difficult to predict its value). It is most noticeable for objects that travel at high speeds (e.g., a skydiver or a downhill skier) or for objects with large surface areas. Air resistance will be discussed in more detail in Lesson 3. The tension force is the force that is transmitted through a string, rope, cable or wire when it is pulled tight by forces acting from opposite ends. The tension force is directed along the length of the wire and pulls equally on the objects on the opposite ends of the wire. The spring force is the force exerted by a compressed or stretched spring upon any object that is attached to it. An object that compresses or stretches a spring is always acted upon by a force that restores the object to its rest or equilibrium position. For most springs (specifically, for those that are said to obey "Hooke's Law"), the magnitude of the force is directly proportional to the amount of stretch or compression of the spring. A few further comments should be added about the single force that is a source of much confusion to many students of physics - the force of gravity. As mentioned above, the force of gravity acting upon an object is sometimes referred to as the weight of the object. Many students of physics confuse weight with mass. The mass of an object refers to the amount of matter that is contained by the object; the weight of an object is the force of gravity acting upon that object. Mass is related to how much stuff is there and weight is related to the pull of the Earth (or any other planet) upon that stuff. The mass of an object (measured in kg) will be the same no matter where in the universe that object is located. Mass is never altered by location, the pull of gravity, speed or even the existence of other forces. For example, a 2-kg object will have a mass of 2 kg whether it is located on Earth, the moon, or Jupiter; its mass will be 2 kg whether it is moving or not (at least for purposes of our study); and its mass will be 2 kg whether it is being pushed upon or not. On the other hand, the weight of an object (measured in Newton) will vary according to where in the universe the object is. Weight depends upon which planet is exerting the force and the distance the object is from the planet. Weight, being equivalent to the force of gravity, is dependent upon the value of g - the gravitational field strength. On earth's surface g is 9.8 N/kg (often approximated as 10 N/kg). On the moon's surface, g is 1.7 N/kg. Go to another planet, and there will be another g value. Furthermore, the g value is inversely proportional to the distance from the center of the planet. So if we were to measure g at a distance of 400 km above the earth's surface, then we would find the g value to be less than 9.8 N/kg. (The nature of the force of gravity will be discussed in more detail in a later unit of The Physics Classroom.) Always be cautious of the distinction between mass and weight. It is the source of much confusion for many students of physics. A 1.0-kg mass is suspended from a spring scale in an effort to determine its weight. The scale reads just short of 10.0 N - close enough to call it 9.8 N. Mass refers to how much stuff is present in the object. Weight refers to the force with which gravity pulls upon the object. Even on the surface of the Earth, there are local variations in the value of g that have very small effects upon an object's weight. These variations are due to latitude, altitude and the local geological structure of the region. Use the Gravitational Fields widget below to investigate how location affects the value of g.
The symbol μfrict-sliding represents the coefficient of sliding friction between the two surfaces. The coefficient value is dependent primarily upon the nature of the surfaces that are in contact with each other. For most surface combinations, the friction coefficients show little dependence upon other variables such as area of contact, temperature, etc. Values of μsliding have been experimentally determined for a variety of surface combinations and are often tabulated in technical manuals and handbooks. The values of μ provide a measure of the relative amount of adhesion or attraction of the two surfaces for each other. The more that surface molecules tend to adhere to each other, the greater the coefficient values and the greater the friction force. The symbol μfrict-static represents the coefficient of static friction between the two surfaces. Like the coefficient of sliding friction, this coefficient is dependent upon the types of surfaces that are attempting to move across each other. In general, values of static friction coefficients are greater than the values of sliding friction coefficients for the same two surfaces. Thus, it typically takes more force to budge an object into motion than it does to maintain the motion once it has been started. The meaning of each of these forces listed in the table above will have to be thoroughly understood to be successful during this unit. Ultimately, you must be able to read a verbal description of a physical situation and know enough about these forces to recognize their presence (or absence) and to construct a free-body diagram that illustrates their relative magnitude and direction. Sometimes it isn't enough to just read about it. You have to interact with it! And that's exactly what you do when you use one of The Physics Classroom's Interactives. We would like to suggest that you combine the reading of this page with the use of our Free-Body Diagram Interactive. You can find it in the Physics Interactives section of our website. The Free-Body Diagram Interactive allows a learner to practice identifying the forces that act upon an object and to express such an understanding by the construction of a free-body diagram. 1. Complete the following table showing the relationship between mass and weight. 2. 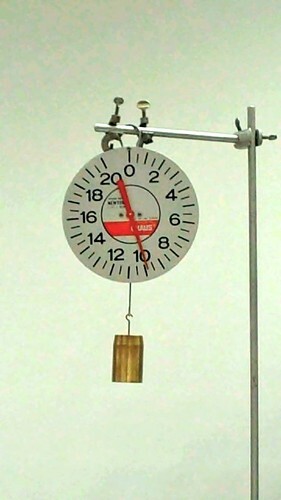 Different masses are hung on a spring scale calibrated in Newtons. The force exerted by gravity on 1 kg = 9.8 N.
The force exerted by gravity on 5 kg = ______ N.
The force exerted by gravity on _______ kg = 98 N.
The force exerted by gravity on 70 kg = ________ N.
3. When a person diets, is their goal to lose mass or to lose weight? Explain. Generally, people diet because they wish to reduce the amount of matter on their body - they wish to remove the blubber. So people diet to lose mass. If one wishes to lose weight, they could get a six fold reduction by moving to the moon. Groovy.